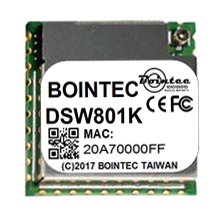 DSW801K is a low-cost and low-power consumption IoT module. This stand-alone module is an operating system designed for wearable or internet of things (IoT) devices with smart connection and cloud application/services. 1x1 11n singlw-band Wi-Fi subsystem, a Bluetooth subsystem, and a Power Management Unit. The application processor subsystem contains an ARM Cortex-M4F MCU, which has many peripherals, including UART, I2C, SPI, I2S, PWM, IrDA, and auxiliary ADC. DSW801K also includes embedded SRAM/ROM and an external 4MB serial flash. The Wi-Fi subsystem contains the 802.11b/g/n radio, baseband, and MAC that are designed to meet both the low power and high throughput application. It also contains a 32-bit RISC CPU that could fully offload the application processor. The Bluetooth subsystem contains the Bluetooth radio, baseband, link controller. It also uses the same 32-bit RISC CPU for the Bluetooth protocols.